A primary ID (PID) is an identifier used by MapViewer as a link between a map boundary (polygon, polyline, and point) and data. Every boundary object in MapViewer can have a primary ID. The primary ID for a selected object is displayed in the status bar at the bottom of the MapViewer window and in the Object Manager. This illustration shows the correspondence between the primary ID on the map and the primary ID in the data. In this example, as with all the U.S. county areas and county data files included with MapViewer, the primary ID is the county FIPS Code. Primary IDs must match exactly between the boundaries on the map and the primary ID column in the data. MapViewer ignores leading or trailing spaces in a primary ID, but any other character is considered part of the primary ID. When there is not an exact match, data is not represented for that area, curve, or point on the map. 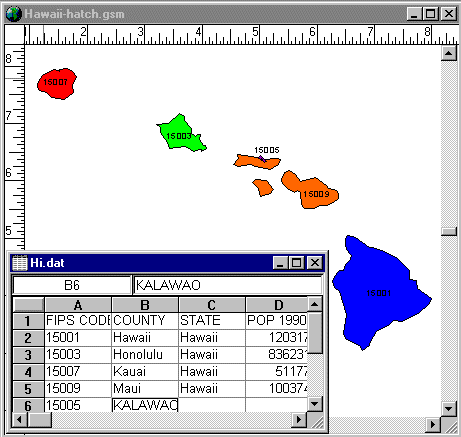 If none of the primary IDs match between the data and boundaries, you will receive an error message when trying to produce a thematic map, indicating that there is insufficient data to produce the map. In this case, you should verify that the boundary primary IDs and the data primary IDs match exactly. If you create your own boundaries for a map, select a boundary and assign a primary ID in the Property Inspector or enter it into the Object Manager. After you have assigned all primary IDs for all the boundaries on your map, you can choose the File | Worksheet command and a worksheet window is opened with all your primary IDs in column A of the worksheet. If you have a data file that already contains the primary IDs, you can use the File | Load Data command to import your data file.